With the cuts which have come in a result of the coalition Government’s deficit busting plans, many organisations have fallen by the wayside. One of the most bemoaned of these is the UK Film Council – arts lovers have declared it a dark time for UK film. But one of the last films to be made and premiered this year, before the UK Film Council finishes its businesses is Nim, a film which has broken ground in more ways than one – but not least of all because of the way it takes a fresh look at sign language, its uses and applications, and crucially, the fact that it is a viable language for communication which may just bridge the gap between humans and animals. It is funded by BBC Films and is undoubtedly a revolutionary tale. The hour and a half long film premiered at the Sundance Film Festival in January 2011 – proof if any was needed that critics are bound to find the film a treat. The basic premise of the story is the real-life tale of Nim, a chimp who was taken as an experience in the seventies to see if he could be raised and nurtured as a human child and therefore learn to communicate his wants and needs. The maker of the film, James Marsh, aimed at making a very honest ‘biography’ of the chimp and used evidence from all of the key participants to do so as well as films from the seventies which actually feature the chimp. What Did the Experiment want to Prove? 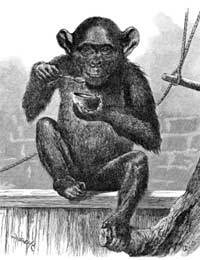 The experiment was carried out by Herb Terrace, a psychologist from the USA, who put the monkey into a rich household in New York. The chimpanzee did indeed discover a knack for communicating, and actually pulling the wool over his carers’ eyes. This is all revealed in James Marsh’s film. But the film is not all warm and fuzzy – it actually starts to delve into the animal’s mind, something made possible by the knowledge that he can communicate and thus, makes him feel more like a sentient being. But it is also the ambitions of the humans and what they want to achieve in proving that this animal can use sign language which make the film an altogether darker watch than may be expected from the premise of the movie. The movie received rave reviews from critics at the Sundance festival, but whether it is a film that is ever likely to receive mass praise is probably not likely. People would still be sceptical about the ability of anyone to teach an animal sign language, let alone that he would actually be successful and be able to communicate through the medium. But James Marsh did win an Oscar for his previous film, Man on Wire, so his credentials are undoubtedly good. And for those who want a thought-provoking look at the way in which we treat animals, and the way in which we view sign language, the film Nim is no bad idea for an evening’s viewing.